After more than five years of referring to the upcoming Blade Runner sequel in generic, hypothetical terms—variably calling it things like Blade Runner 2, Blade Runner Again!, Blade Runner-er, Are They Really Making A Blade Runner Sequel?, Why Are They Making A Blade Runner Sequel?, Do Blade Runners Dream Of Eyelinered Jared Leto? and so on—the film at last has an official title: Blade Runner 2049, so named for the fanciful, far-off dystopia we can all expect to plunge into about 32 years from now, give or take what happens in November. 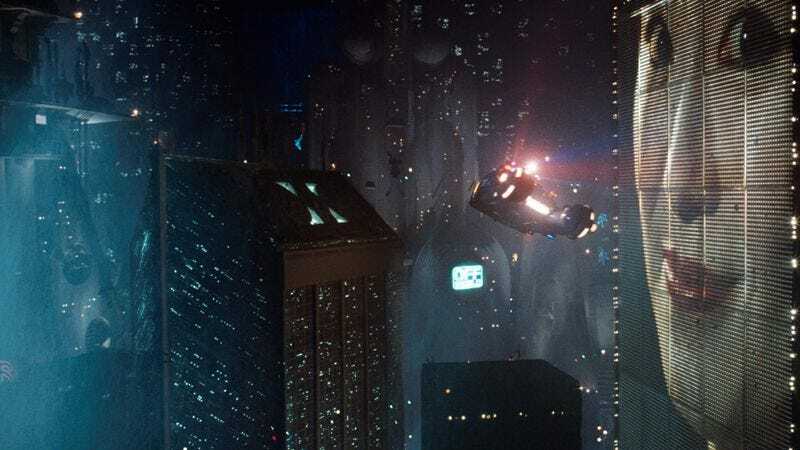 That’s a slightly shorter leap than Ridley Scott’s 1982 original took when it painted its wildly imaginative picture of Los Angeles in 2019, a city ravaged by environmental disaster whose residents are constantly bombarded with advertisements and seek their cheap pleasures in technology. As director Denis Villeneuve explained to Entertainment Weekly earlier this year, his sequel basically adds three extra decades of shittiness to that, suggesting that humanity will somehow continue to shrug off doing anything about the worsening climate and grow yet more isolated from each other. Fortunately, unlike the original Blade Runner, there’s still plenty of time for us to ignore the implicit warnings of this one. While there are still no concrete plot details, producers did release this photo of Villeneuve, Scott, Harrison Ford, and new addition Ryan Gosling hanging out around a bar, as Ford tells each man in turn why he’ll be glad to be dead in 30 years and won’t miss them, specifically. You might also notice Rick Deckard’s old, familiar blaster, and old, familiar whiskey tumblers, and old, familiar bowl. It seems the inhabitants of Blade Runner 2049 will still enjoy shooting, drinking, and tossing salads, so—whatever your reservations about the rest of this sequel’s world—at least that’s something to look forward to.